There is a very prominent tale in Mahabharat where Draupadi had a bowl of plenty awarded to her by Sun god when she along with the Pandavas was in exile. She could take as much food from the bowl as she wanted until she herself has eaten. 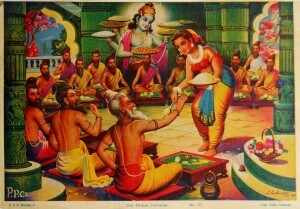 One day sage Durvasa and his disciples arrived at her hut and asked Draupadi to feed them. Rishi Durvasa was known for his anger. To add insult to injury, she had already consumed food that day and knew that the pot would not yield any more eatables. She prayed to her Sakha, Lord Krishna for help. Incidentally, one grain of rice was left in the bowl. Lord Krishna took that grain and ate it up. 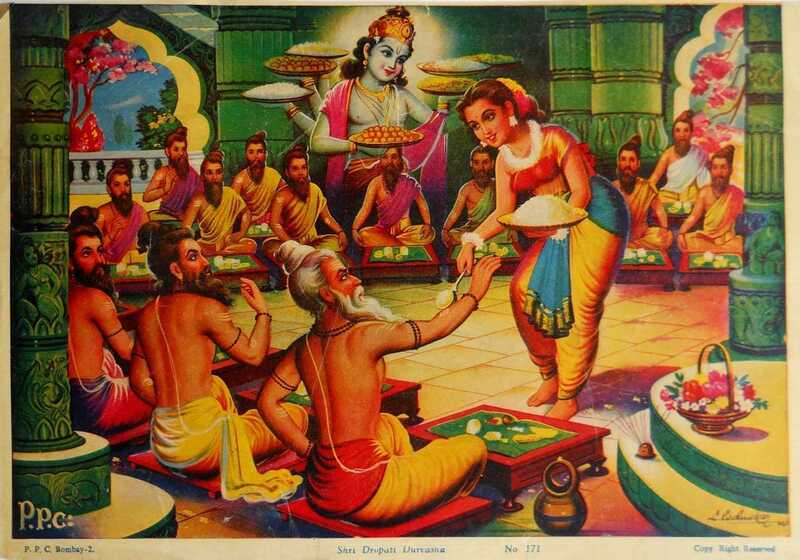 To Draupadi’s surprise, Lord Krishna let out a belch as if just been fed with a sumptuous three-course meal. With him all the beings of the universe: the deities, yakshas , Gandharvas and also, Sage Durvasa and his disciples were satisfied. This story indicates the importance of food in Hindu culture and mythology. In fact, food is central to almost all Hindu rituals and modes of worship. The Bhagavad Gita declares: “If one offers Me with love and devotion a leaf, a flower, a fruit, or water, I will accept it.” (9.26). The food is served in a clean place and before eating, water is sprinkled around the plate and vedic mantras are recited. 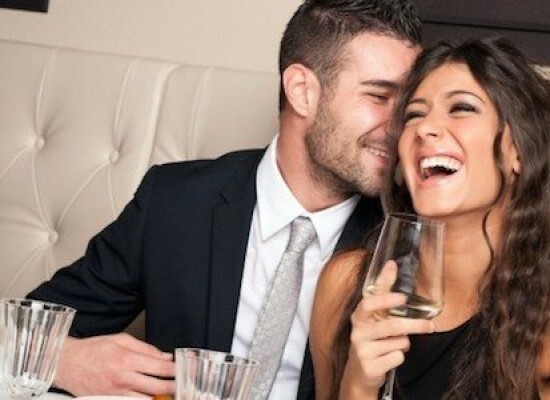 A little water is sipped before eating which is scientifically proven to be beneficial. The intension is that our mind and intellect remains inclined towards spirituality and virtues while doing everything, even, eating. Hindus believe that everything in the mortal world including, the five sense organs, the objects of the sense organs, elements, mind and intellect are essentially made of three qualities: Sattwa, Rajas and Tamas. Sattwa is associated with light, knowledge and purity; Rajas with activity and passion; and Tamas with ignorance, stagnancy and delusion. 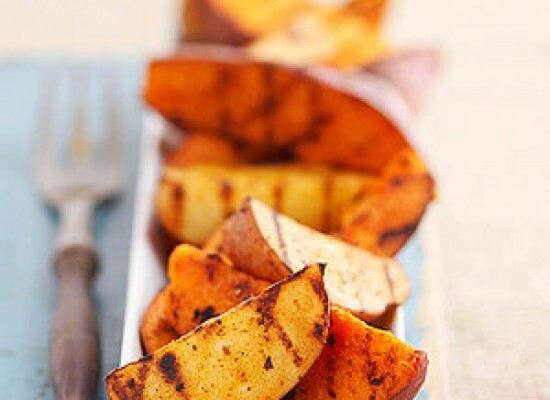 Consequently, different food items have different tendencies attached to them. 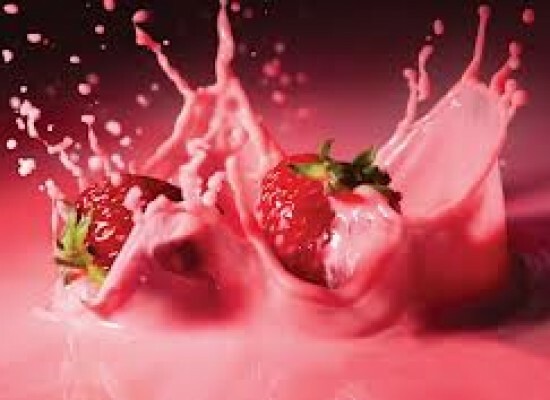 Foods which increase life, purity, strength, joy and cheerfulness and are savory, substantial and agreeable are Sattwic. 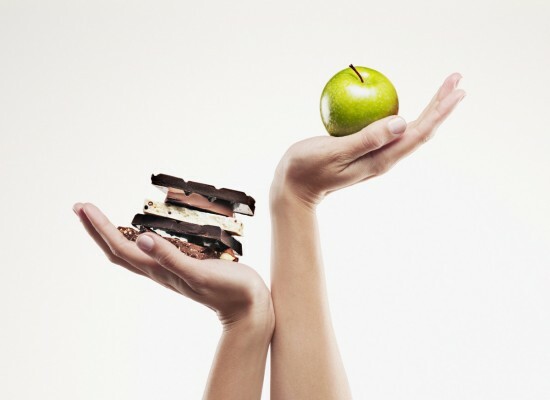 This includes fruits, nuts, vegetables, milk and grains. 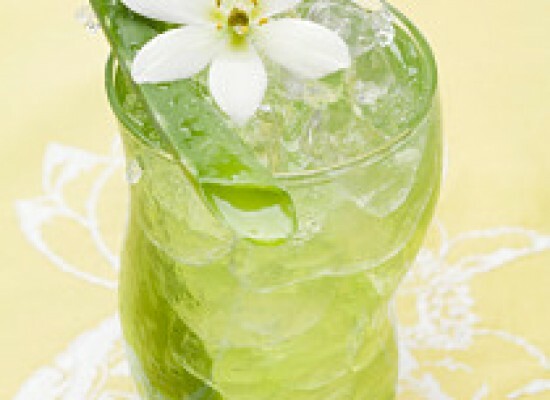 The foods that are bitter, sour, saline, excessively hot, dry, pungent and burning are known as Rajasic. Onions and Garlics fall under this category and are believed to inspired passion in individuals. Tamasic food includes meat, alcohol, eggs, fish etc. Although, vegetarianism is encouraged in Hinduism, it is important to understand that these are mere guidelines that are provided to individuals to help aid the practice of meditation and there is no compulsion as far as adherence is concerned. 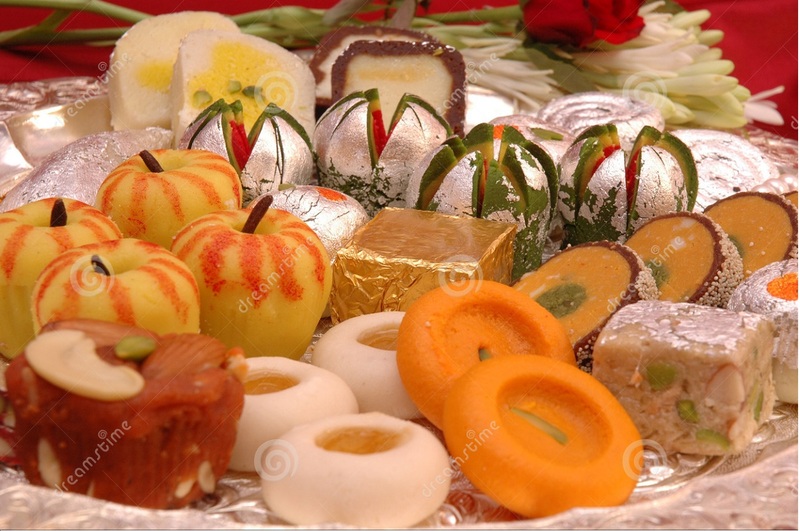 Another important aspect of Hindu rituals is Prasad or the sacred food offering to the lord. 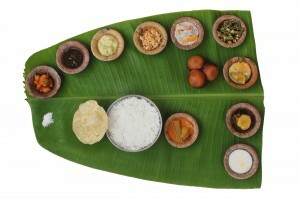 Almost every Puja or worship is concluded by the distribution of Prasad i.e. the food that was offered to the lord during the worship. Prasad can include a variety of things such as jiggery, sweets, coconut, fruits, sweet rice, milk, tulsi leaves (Basil) etc. The intension of the devotee is of prime importance here and not the material worth of the offering. Depending on one’s position and ability, one can offer anything with devotion. A few tulsi offered with a pure conscience will reap greater merit than gold offered with arrogance. Growing up in a Hindu household, I have vivid memories of being restless during the entire course of my mother’s daily prayers and waiting for the Prasad at the end. During Navratras, the nine day worship of the divine mother, Bhandaras are organized. Bhandaras are spiritual gatherings where large quantities of food are prepared by the community and then distributed to everybody who attends it. This is a form of community service where poor and ailing are fed alongside the affluent and thus establishing their equality in the eyes of the lord. Feast and fast, both are essential part of the Hindu experience. 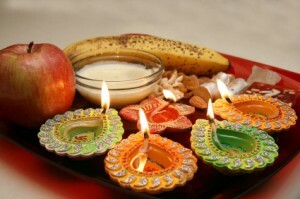 The festivals of Diwali, Holi, Dussehra and Janmashtami are often associated with the preparation of delicious foods. People visit their friends and relatives and offer each other food. This helps in spreading harmony and unity in the community. Hinduism offers a great deal of flexibility even in the case of fasting. Fasting can be complete, eating “purer” foods, adopting a completely vegetarian diet or it can be abstaining from favorite foods. It can be seen as a means of purification or as a sacrifice. 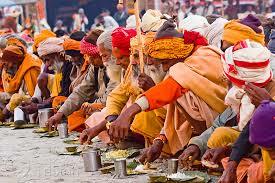 The Hindus are known to use hands to consume their food. 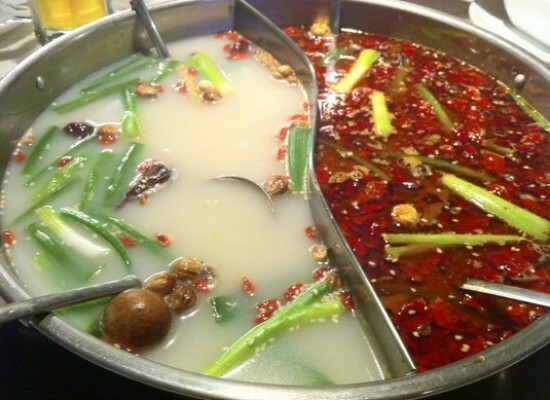 The idea is to savor the food with as many sense organs as possible: the color and appearance of the food with eyes; its rich aroma with the nose; it’s delicious taste with the tongue and its texture with the hands. There is an interesting story regarding this. The Indian president, Dr. Radhakrishnan once met Britist Prime Minister Winston Churchill and they sat down for lunch. Before eating, Dr. Radhakrishnan washed his hands and when the food was served, took a morsel in his hands and began eating. Churchill told Dr. Radhakrishnan, “Why are you using your hands? Use spoon and fork, they are more hygienic”. Four Appetizers from Bangladesh that Will Blow Your Mind!